INDIO HILLS, Calif. — One person was killed and two others injured Saturday in a collision involving bicyclists and a car that witnesses said was moving as fast as 100 mph along the route for California’s Tour de Palm Springs. 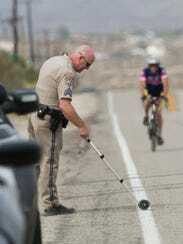 Numerous bicyclists participating in the Tour de Palm Springs were traveling eastbound on Dillon Road near Indio Hills, Calif., as the vehicle, a sedan, came from behind and veered into the westbound lane and then went off the roadway onto the dirt shoulder where the driver lost control, California Highway Patrol Sgt. Isaiah Kee said. The vehicle then veered back across the roadway into the eastbound lane, struck two bicyclists, and continued over a dirt berm and rolled. One cyclist died at the scene. A second cyclist was airlifted to a hospital with serious injuries and the driver of the car was taken by ambulance to an area hospital for moderate injuries, Kee said. Several of the cyclists told investigators the car was traveling at more than 100 mph, he added. The roadway is mostly straight but with a lot of hills. The posted speed limit is 50 mph. Speed may have prevented the driver from seeing the cyclists early enough to slow down and avoid hitting them, Kee said. “There were so many participants that it was easy to see that there were bicyclists coming … not like you’re traveling down the road and all of a sudden encounter a few bicyclists,” Kee said. The crash occurred as cyclists in the “tail end” of that portion of the race passed through the area, Kee said, adding that he didn’t believe officials rerouted other cyclists. The California Highway Patrol is investigating the crash and no other information about the deceased or injured cyclist and driver was immediately available. Whether drugs or alcohol were involved is still under investigation, Kee said. Michael Stearns, a spokesman for the Tour de Palm Springs, said later Saturday that the group was still collecting information and didn’t have enough details to comment on the crash. The area where the crash occurred is part of the Tour de Palm Springs’ 100-mile ride route. This is at least the second time a fatality occurred during the Tour de Palm Springs. In 2014, an Alta Loma, Calif., woman was killed when she was hit by a pickup in Thermal, Calif. Authorities said Lavonne Koester, 55, who was at mile 67 of the 100-mile route, rode into the path of a Dodge truck and was thrown from her bike. She died at a hospital. Investigators in the 2014 crash said Koester ran a stop sign and the pickup’s driver was not at fault.